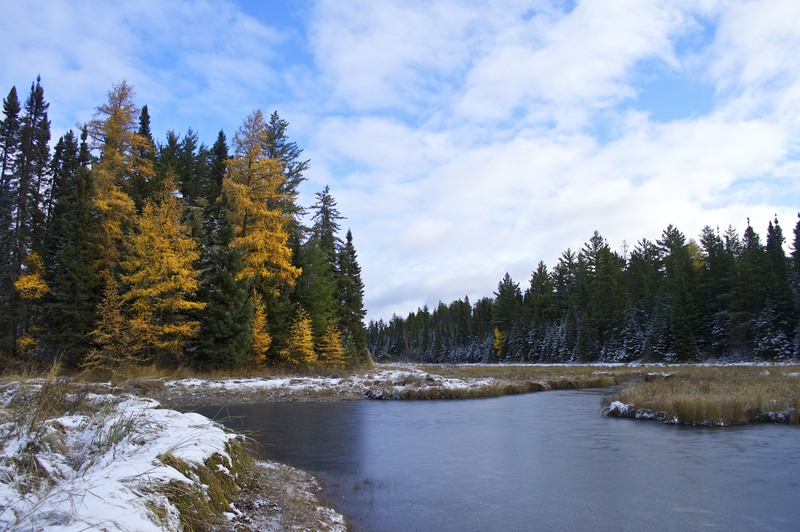 “I look forward with much anticipation to the cold weather and snow, of watching this vibrant wilderness slowly become desolate and still for the winter. 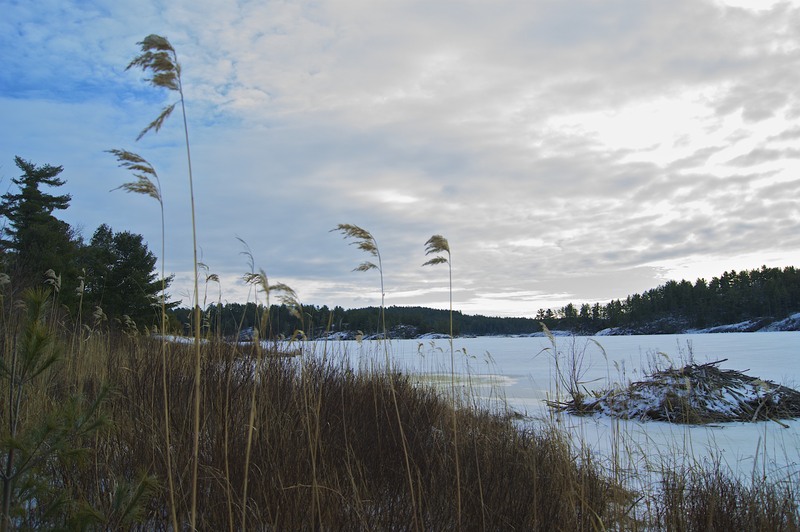 How silent this lake country must be during the snowy months! The transition to such times is upon the land with each day inching towards the inevitable winter. The deciduous trees are the most obvious signal of this, with some trees such as the maples and aspens quickly surrendering to the impending forces of nature, meanwhile some choose not to be dissuaded so easily – the oaks clinging to their summertime colors to the bitter end, the birches ever so slowly turning yellow as if delaying would help them hold on to the precious leaves they spent so much energy producing in the springtime. 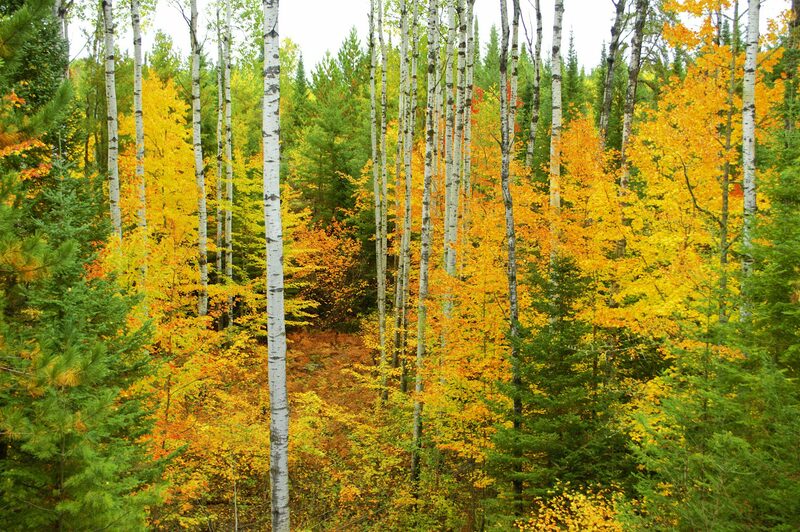 The only trees fortunate to keep their leaves are the majestic pines, constant and steady in all seasons and temperatures. They provide a flicker of hope, a reminder of the warmth and growth of spring, a light that shines dimly in the darkest and coldest of winter’s days. A lighthouse in the barren seas of the forest. The disappearance of the summer birds seems to accompany the colors and dropping of the leaves. The wild north country always becoming a touch less musical as the southern climates call to its winter residents to come on home. I wish these birds would stay that I could listen to them all winter – the “violin notes” (Sigurd Olson) of the hermit thrush, the elegant and haunting cry of the loon on the still water. But what would make spring a time of enchantment if it were not for the return of these most beloved fliers! As much as I want them to stay in the northwoods, I still find here birds that staked their year round claim to these bogs, thickets and forests, and in late fall I come to truly appreciate their presence and be thankful for the few jubilant birds that remain. Of these, the black-capped chickadee and red-breasted nuthatch are the most pleasing. The chickadee seems as satisfied in the numbing cold as in the sun of the spring – in fact he might even be more content with the former. It is marvelous that the Lord left such a social and inquisitive bird for the winter, perhaps he knew how much mankind needed to be cheered when the gloomy skies of January and February come. In every walk in the frozen world of winter I hear chickadees calling and oft times I see them, usually rather close. Even in the late days of October they are there fluttering around the stripped trees, finding eternal joy in all that is beheld in that moment. What lessons a chickadee can teach about how to live! 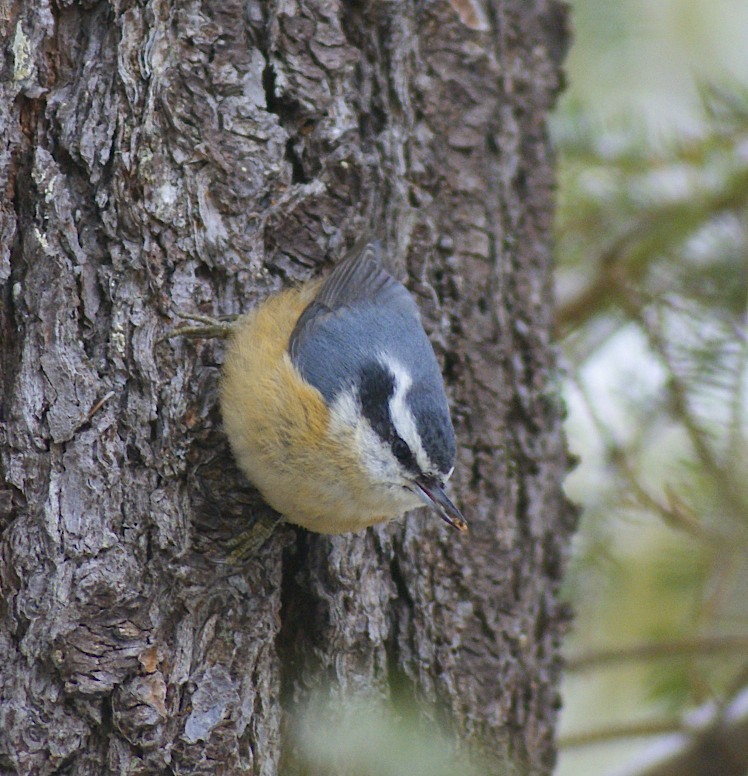 But the woods would not be the same without the gentle, nasally ‘yank’ of the red-breasted nuthatch. At times this master climber of trees can be hard to spot, at others he is as visible as the chickadee. I so vividly remember watching a nuthatch two years ago in the pines of McGregory Bay. With such grace it climbed up and down and all around the various limbs of a mature white pine. Then he would work over the cones of the other pines nearby, often hanging upside down as he inspected the drooping cones. Yet even without this acrobatic display the red-breasted nuthatch is wondrous simply by his plumage alone. The dull, blue back and wings, the black eye stripe and crown accented by the white in between the two, the white throat and whitish orange breast – all of which make the nuthatch a bird of beauty. The beauty only increases when it is seen in the rich green of the pines. I have found that these creatures are much easier to spot once the leaves have fallen as they are small and adept at staying hidden, though I do frequently hear them calling when I cannot hear them. I suppose with the leaves mostly gone I will begin to see this great bird in the forests of the Boundary Waters. If not, though, the song alone is enough to cheer me. With the falling leaves I find myself sloughing off the leaves of summer and preparing for the winter. I am excited for this change. I love the crisp, sharp mornings of fall. I love what they imply. I have come to enjoy and anticipate the coming of each new season, I do not look forward to one more than any other. Each one has a place in my life and I see the natural wonder that comes with each one. None is more beautiful than the other, they are simply beautiful in very different, distinctive ways. The beauty of the fall begins with its colors, the coolness of the night, the honking of geese as they head south. It is continued once the trees are left looking as though dead, for this is the time of thick fur coats for the furbearers and the rutting of the whitetail buck. Before long winter is upon the land and the first snow is enchanting. It clings to the trees and branches, more beautiful of a sight cannot be found. By mid-winter the snow has settled down on the land, and the natural world looks desolate, and there is the beauty. The still land, the utter silence, the absence of obvious life. Ah, a red breasted nuthatch, no less! Comical little birds! beautiful photographs and writing as well. you’ve really captured the spirit of the season change. the light snow in the photos really makes me excited to welcome winter!